In honor of the 500th anniversary of Holland's most famous painter 'Hieronymus Bosch', Studio Kluif designed a series of two exclusive and limited plates. A crisp white plate with an elegant print in blue. The plate has a diameter of 31 cm and has a slightly raised rim . Wonderful as underplate at an upscale diner or to present your snacks, biscuits or cheese. Presenting on a 'Jheroplate' brings a topic of conversation for your guests which helps to break the ice immediately. Set the table even better combining this blue additional Jheroplate with its blue brother. Beautiful porcelain plates with Delft blue print to celebrate the 500th anniversary of Hieronymus Bosch. 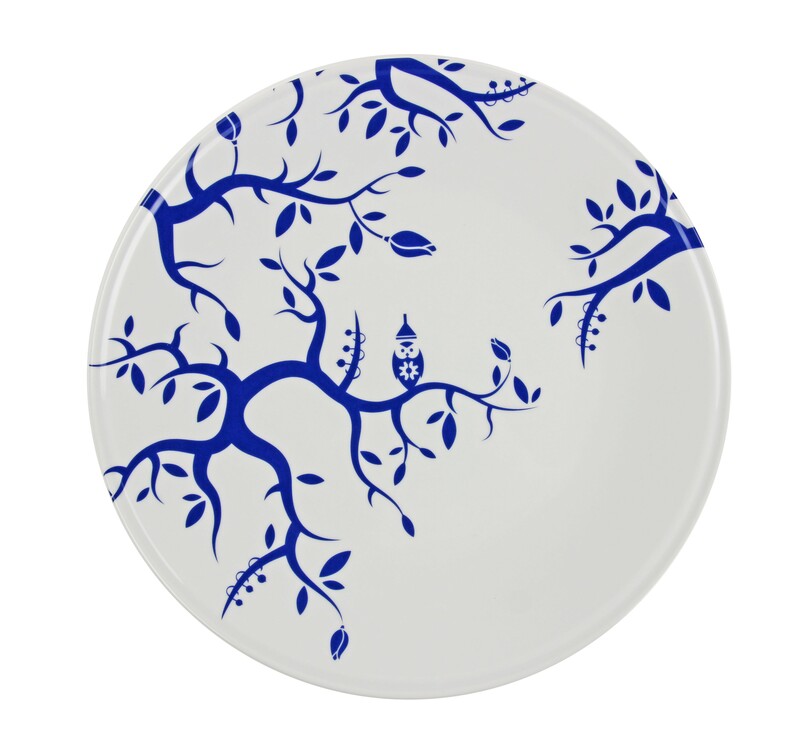 The ornate plates have a diameter of 31 cm, a raised edge and are produced by Royal Delft. The plates were designed by Studio Kluif and they are inspired by the surrealist paintings of Hieronymus Bosch. In honor of the 500th anniversary of Hieronymus Bosch is a series of these plates 'Jheroplate' designed. These plates are designed exclusively for the occasion and are available in a limited edition. This 'Jheroplate' is a crisp white Jheroplate with Delft blue pattern. Around 1450 Hieronymus van Aken was born in Hertogenbosch. After primary school Hieronymus went to the Latin School, which distinguishes him from most of his peers. At the age of 12 Hieronymus started to practice painting on canvas. At the age of 20 he married the wealthy Aleid van Meervenne and he moved to Aleid's house on 'De Markt' in Den Bosch. His reputation as a painter grows in those years considerably, both inside and outside the city of 's Hertogenbosch and he gained respect and status and started to signe his paintings with his stage name 'Hieronymus Bosch', inspired by the city where he lived, loved, painted, died and was burried.